Since someone actually complimented my rather dry (I even knew I was pushing it – like a mouthful of saltines) post a few days back on Twitter and Flickr affecting the iliveisl blog and our Second Life estate endeavors, I decided to show the stats on the iliveisl site. Why even post about it? Well, we are committed (maybe should be committed) to making a great place for people to call home and run businesses in Second Life. And part of that is a business plan that includes marketing. A business plan is important to make sure that the estate sticks around for a long time. Part of that is, of course, the inworld aspect in running the estate and working with residents. Ener Hax heads that up and does a great job and has the help of several generous residents. Many people in Second Life talk a big game: “ooh, we can do this” and “we can do that”. But talk is cheap. Apart from spending time inworld (on the estate, doing custom projects, and mentoring), we also spend time out here (it sure would be nice to TP away sometimes – if you know what I mean). Second Life is a great creative space and we love sharing that with you. Okay, get ready, set . . . snore. Err, I mean let’s look at the score! A website grade of 85/100 for iliveisl.com means that our algorithm has calculated that this site scores higher than 85% of others in terms of its marketing effectiveness. The algorithm uses a proprietary blend of over 50 different variables, including search engine data, website structure, approximate traffic, site performance, and others. 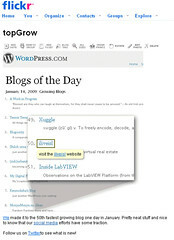 The website iliveisl.com ranks 169,271 of the 1,113,217 websites that have been ranked so far. Your website has an Alexa rank of 3,129,452 which is in the top 11.18 % of all websites. The Alexa rank is the one we put a lot of credit into and it’s really nice seeing that we are in the top 11%. That is far better than we anticipated! I posted over on a blog we have at my day job and wanted a sample image talking about maximizing return for effort. It’s very easy to spend too much time trying to market yourself. The image above uses these tips and I discuss this as part of your strategy to maximize WordPress blogging over here.